Krishen Khanna: There is no dialectic or direct communication any more, in much of the art being hyped today, Its artists are pretenders. Srimati Lal: Would you say that today’s ‘trendy art’—or should I say, ‘Pretendy Art’—has become more like an Advertisement? KK: Yes, completely! It’s an artificial projection – and also a ‘production’; as opposed to the solitary activity that we understood Fine Art to be. Art isn’t meant to be a production involving hundreds of faceless people... it’s one individual’s unique, personal statement of truth. Artificialised images of India are now being deliberately ‘manufactured’ and ‘projected’ via clever ‘gallery-productions’ or ‘art-advertisements’; for which ‘trendy artists’ need artificially-large spaces—like industrial warehouses—to ‘manufacture’ their ‘productions’. There’s something very wrong with all this. It’s actually a deliberate infiltration of imposed western notions, which are totally destroying the personal element in contemporary Indian art. SL: Beauty, too, seems to have become an unfashionable word in such stagy art-‘productions’. As has Poetry. But aren’t beauty, poetry and truth essentials for great art? KK: Of course they are absolutely necessary for good art! But all this is being destroyed in today’s art milieu. We must be aware of this ... and seriously concerned. 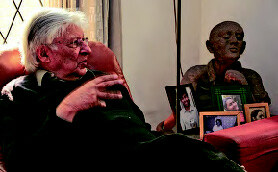 Krishen Khanna, 86, is one of the surviving pillars of Indian contemporary art. A core-member of the influential Progressive Artists’ Group founded by Souza in the 1940’s, this jovial and affable Punjabi corporate-banker turned-painter, remains observant and articulate. Khanna has been living in a contemporary red brick bungalow in Gurgaon’s DLF Phase I for the past ten years. He was awarded the Rockefeller Fellowship in 1962, was an artist-in-residence in Washington until 1964, and has been a key decision-maker for the Lalit Kala Akademi, Bharat Bhavan in Bhopal, and the National Gallery of Modern Art. Khanna was awarded the Padma Shri in 1996. He sold his first painting to Dr. Homi Bhabha, for the Tata Institute of Fundamental Research, in the 1950s in Bombay; and has stuck to painting ever since – giving up his banking career. I ask the artist how he likes Gurgaon --- whether he can relate to it. “Frankly, no. There are no sophisticated cultural groups in Gurgaon. I lead a reclusive existence here. Actually I never really felt I ‘belonged’ anywhere after the Partition, to be honest. I was born in Lyallpur, Pakistan, in 1925; and I studied Art at Lahore’s Mayo School. That felt like home to me.” I discern a wistful shadow of pain and bewilderment in the senior artist’s gaze. Khanna first moved to Simla after the Partition. As a bachelor, he took up a job with Grindlay’s Bank for practical reasons, despite the fact that he had actually studied Fine Art in Lahore. However, Art and creative expression remained his secret passions; and was in regular touch with emerging art circles. After a few sessions at Bombay’s Progressive Artists meetings, Souza—impressed by Khanna’s articulation and sophistication—invited him to join the Progressives. These pioneer-artists believed in actually painting their inner truths as solitary acts upon their canvas; with no via-media to interrupt, influence or intrude-upon their visions. Souza, Ram Kumar, Gaitonde, Tyeb Mehta, Raza, Padamsee, Husain – all had different styles, and vastly-differing personalities. And yet they also had a clear vision that bound them. They adhered to a unified urban Indian credo: thus creating a major aesthetic movement. And they lived simply, completely immersed in their art for most of their lives. Such an intellectual art-movement is unfortunately lacking in the Indian art world of today. Now, younger artists, too often in a hurry to make an ‘international name’ and fast money, and exposure, are quickly producing clever—at times shockingly-sensationalised—installations, and gimmicky imagery. At face value, these may look ‘cutting-edge’ and ‘cool’; but upon closer inspection, they lack integrity, insight, painterly skill, and an authentic Indian-urban style – which was the leitmotif of the Progressive pioneers. Khanna’s paintings blend the abstract and the figurative in a manner at times playful, at times misty, sometimes hazy. He has depicted displaced, frenetic figures that he observed with dismay during the Partition; people spending their days on Indian pavements; figures reading newspapers and sharing soulful shairi while sipping chai; India’s trucks and dusty vehicles rattling along; urban literary subjects; and Christian themes of the Crucifixion. A much larger horizontal canvas of 2008, called Descent of Christ From the Cross, seems to invoke Krishen’s late colleague Souza’s heartrending visual inspirations. And a vertical painting done in 1999 depicts a misty, lovelorn young swain, looking soulfully at his sepia-toned Indian Juliet. Called A Suitable Boy, this canvas was inspired by Vikram Seth’s novel of that name. Many might not know that Krishen Khanna is also a poet, with Literature as his second love. He was a friend to many Indo-Anglian literary pioneers in the cosmopolitan salons of Bombay and Calcutta; and he still participates in poetry-readings. Indian yellows, desi reds, and terracotta tones. The painting delineates an interesting dramatic contrast between stiffly-starched neo-colonial band-uniforms, and the tattered garments of the dhaba-boys. “Why the theme of Bandwallahs,” I ask. Khanna explains, “Twenty years ago, when I painted in a studio at Garhi in East of Kailash every day, I stepped out on the street one afternoon to see this very colourful troupe of Bandwallahs totally blocking the road. They stopped me from moving on that galli – and yet, they also broke me out of my monochromatic palette that I had been using for several years. Their images lingered long in my mind. That is the artistic impact of India. I ask the painter what themes he has been painting most recently. “All sorts of people engaged in reading newspapers ... this image interests me greatly. I still paint Bandwallahs, but no more Christian subjects. I don’t retain obvious ‘outlines,’ but the forms are retained... I don’t let a sketch ‘stop’, so to speak. Don’t you paint beautiful women, I ask, seeing a notable absence of this vital painterly subject in the works in Khanna’s studio. On the way out, at the gate of his Gurgaon home, I see Krishen Khanna’s nameplate calligraphed in a slanting, hazy script. I ask him if that is actually his own signature. The artist gently moves his finger across his name, carving a slim rivulet of thick dust. “No – it’s just Gurgaon dust!” he says... and laughs, rather sardonically. Krishen Khanna’s tangential and oblique figurations in paintbox colours—often reminiscent of the work of a small boy with his first drawing-book, happily playing hookey from school—also seem to invoke the Biblical saying: “Dust unto dust”.